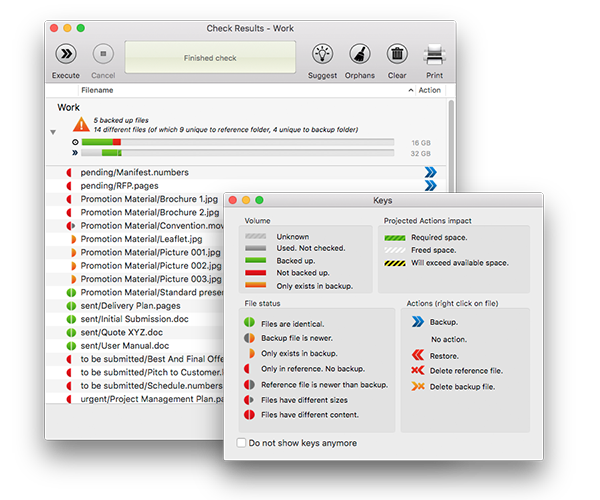 BackupCheck is a simple tool to check all files are properly backed up. It does it as you would manually do by listing and checking each files one by one. This means backups are not encoded or packaged in anyway, a simple copy of each file is checked to be in a mirror directory. As you would do in the absence of any software. This way you always have control over your files and are not dependent on any tool. Not even on BackupCheck. BackupCheck compares the contents of specified folders with backup mirrors. It provides clear visual backup status for each file. From the status display, relevant actions on files, such as launching a backup, can be easily initiated, the user remaining always in control. File backups are plain copies of the original files. No tools are necessary to recover the original files. Simple drag-and-drop in the Finder will restore your files. Of course, BackupCheck can also be used for that purpose, but it is not mandatory.